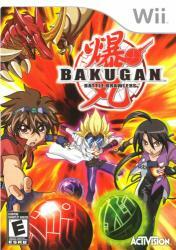 Start off as an untrained Bakugan Brawler and must fight your way to the top of the heap. Combining the drama and story of the cartoon series with the skill and strategy of the card game, players will become completely immersed in this unique title. Throw Bakugan cards onto the battlefield, and then try to carefully shoot your Bakugan balls onto the cards to unleash their monstrous powers. When two Bakugans stand on the same card, they transform into gigantic creatures and fight to the finish!